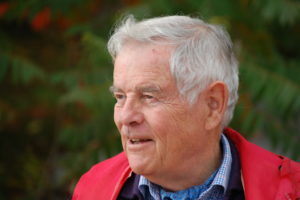 James Bacque, who was born and educated in Toronto, is a former journalist, book editor (Macmillan of Canada) and publisher (newpress). He has written novels, essays, short stories, a biography, a play and books on the history of postwar Germany. His best sellers Other Losses and Crimes and Mercies have revealed atrocities committed by the allies against German POWs and civilians after World War Two. James Bacque’s fiction titles include The Lonely Ones, 1969 (Big Lonely in the paperback editions 1970 and 1972); A Man of Talent, 1972; The Queen Comes to Minnicog,1979; and Our Fathers’ War, 2006. He has written a biography of Raoul Laporterie, Just Raoul: Adventures in the French Resistance, 1990; and a collection of essays with Richard Matthias Mueller, Dear Enemy: Germany then and now, 2000. The history titles Other Losses and Crimes and Mercies, both best sellers in English and German, have sold over 300,000 copies in 13 countries around the world. Bacque’s work on postwar Germany has been the subject of a book, three academic conferences, and many articles. Four TV documentaries about the work have been broadcast in Canada, the UK, the USA, France and Germany. Bacque has won the Bismarck Medal. Recently, he directed a one-hour documentary film entitled Other Losses, available as a DVD, which includes unique archival footage and new interviews with survivors of allied vengeance in conquered Germany. The film is a co-production with Kyffhaeuser Verlag of Germany. His comedy Conrad, satirizing Lord Bilk of Cross-purposes and based on a famous Canadian newspaper tycoon, was performed in the George Ignatieff Theatre, Toronto, in September 2009 and again in January 2010. Spirit Builders, his forthcoming book, a history of the healing work of Frontiers Foundation among Métis and band members on reserves will be published by Rocky Mountain Books of Victoria in the fall of 2016. James Bacque lives with his wife Elisabeth, an artist, in the woods beside Georgian Bay. Their four children visit often bringing their families, tents, food, boats, dogs and much joy.